Choose a color from the company’s logo as a base color. When you’re in doubt, a color like blue is always a safe choice as it’s been proven to be among the top sales colors. 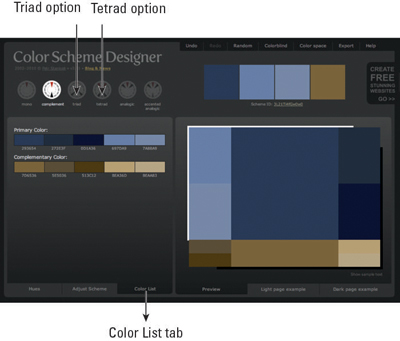 Go to the Color Scheme Designer website (or some equivalent site). 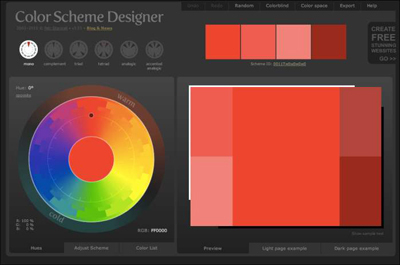 Color Scheme Designer, which is shown in the following figure, is a free tool that suggests complementary colors. Type in the RGB code for a base color you’ve chosen. Click on the RGB text on the lower-right side of the color wheel. A dialog box will appear. 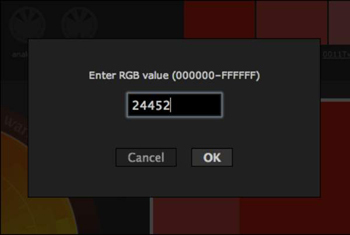 The figure below shows where you enter the RGB code. Choose the Triad or Tetrad option to get a mixture of colors that goes perfectly with your data viz (see the following figure). Click the Color List tab to see the numbers of the colors in the set. After you’ve finalized your color scheme, you can apply the colors the same way you would if you had company branding guidelines.